We have a lot of sophisticated analyses that try, with great precision, to predict and describe existing systems in terms of an assumption of universal rationality and a sub-assumption that what that rationality tries to do is maximize returns to the self. Yet we live in a world where that's not actually what we experience. The big question now is how we cover that distance between what we know very intuitively in our social relations, and what we can actually build with. 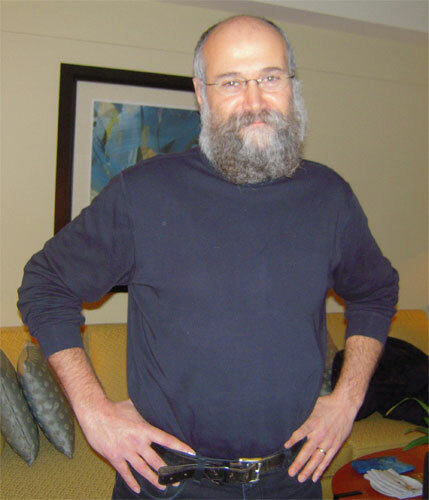 YOCHAI BENKLER is the Berkman Professor of Entrepreneurial Legal Studies at Harvard, and faculty co-director of the Berkman Center for Internet and Society. His research focuses on the effects of laws that regulate information production and exchange on the distribution of control over information flows, knowledge, and culture in the digital environment. He is the author of The Wealth of Networks: How Social Production Transforms Markets and Freedom. [YOCHAI BENKLER]: The big question I ask myself is how we start to think much more methodically about human sharing, about the relationship between human interest and human morality and human society. The main moment at which I think you could see the end of an era was when Alan Greenspan testified before the House committee and said, "My predictions about self-interest were wrong. I relied for 40 years on self-interest to work its way up, and it was wrong." For those of us like me who have been working on the Internet for years, it was very clear you couldn't encounter free software and you couldn't encounter Wikipedia and you couldn't encounter all of the wealth of cultural materials that people create and exchange, and the valuable actual software that people create, without an understanding that something much more complex is happening than the dominant ideology of the last 40 years or so. But you could if you weren't looking there, because we were used in the industrial system to think in these terms. A lot of what I was spending my time on in the 90s and the 2000s was to understand why it is that these phenomena on the Net are not ephemeral. Why they're real. But I think in the process of understanding that, I had to go back and ask, where are we really in between this what's-in-it-for-me versus the great altruists and the stories of Stahanovich and the self-sacrifice for the community? Both of them are false. But the question is, how do we begin to build a new set of stories that will let us understand both? The stories are actually relatively easy. How we build actual, tractable analysis that allows us to convert what in some sense we all know, that some of us are selfish and some of us aren't. That actually most of us are more selfish some of the time and less selfish other of the time and in different relations. That we don't all align according to the standard economic model of selfish rationality, but that we're also not saints. Mother Teresa wouldn't be Mother Teresa if everybody were like her. So this is the puzzle that I'm really trying to chew on now, which is how we move from knowing this intuitively and having a folk wisdom about it to something that probably won't in any immediate future have the tractability and precision of mainstream economics. Not, by the way, that as we sit here today, mainstream economics necessarily enjoys the high status that it might have a few years ago, but nonetheless so that we will be able to start building systems in the same way that we thought about building organizational systems around compensation, like options that ties the incentives of the employees to that of the business, like we thought with regard to political science that's completely pervaded today by the understanding of, how does politics happen? Well, it depends on what the median voter wants and what the median Senator wants, and all of that. There are lots of different disciplines where people have been doing work for a long time. In many cases, doing work that was peripheral during the period of the rise of selfish rationality. Really we're talking about a period from about the 1950s until roughly now, when in economics, in political science, in law, in evolutionary biology, you got an increasing relative importance for explanations that depended on individuals acting in ways that maximize their returns, where their returns largely are assumed, though not universally, to be material with self-interest. Game theory and mechanism design imagines people as acting with self-interest and guile. Political science builds models that are based on self-interested voters and self-interested Senators and self-interested Congressmen, each one trying to understand what is their interest. Is it to get elected again? Is it to maximize a particular position? And each time you build a system around this idea of individuals interacting, trying to maximize their own returns. In evolutionary biology, for example, one thing that you saw was the rise of very sophisticated ways of explaining behavior that seemed to be altruistic, purely in terms that redounded to the benefit of the individual organism. This is where reciprocity becomes so important. What we see again throughout all of these different disciplines is that somewhere around the 80s in some places, like organizational sociology, somewhere closer to the 90s, if you talk for example about evolutionary biology and the resurgence of the possibility of multi-level selection and group selection where it's not all reduced to the individual, there are also components that happen at the group level. Certainly in the context of political science and the emergence of some studies of commons and common property regimes and collective actions — successful collective action models. In economics, we see a substantial work in experimental economics, like Ernst Fehr's group in Zurich and Sam Bowles and Herb Gintis in Santa Fe, starting to do experiments that show that people deviate from selfish rationality. That people systematically and predictably behave in ways that are much more cooperative than would be predicted by the game theoretical impact. You've got theoretical economists, like Roland Benabou, Jean Tirole, and Matthew Rabin, who begin to build quite sophisticated models that try to implement very different kinds of motivations, like even a sense of self image and a sense of 'I'm okay' relative to the world. (There is a beautiful study, for example, from two or three years ago about knowledge workers. (Bruno Frey and Margit Osterloh)) A sense of what's normal and moral. A sense of what's socially preferable. You begin to see even in economics in the '90s and early '00s, an increased salience and attention and major complications to(?) efforts to build much more sophisticated models of multiple motivations including pro-(Inaudible) motivations. In organizational sociology, in management science, you look — Toyota production system was the big ah-ha moment, when Toyota came to the U.S. for the first time and created the first NUMMI plant in GM's Fremont plant in the early '80s. All of the stories that used to be "oh it's Japanese culture, it's something completely different, it's not about us," were flipped. One of the worst performing GM plants in 1980 closes down, opens up two years later under Toyota management, almost the entire same employees said the entire union leadership. Within a couple of years it becomes the most productive plant in the U.S.
Who knows what the situation is now, but as of the numbers last year, it continued to be one of the three most productive plants in the U.S. Same people, same industry, very different organizational structure built a lot less on hierarchy, a lot less on precise specification of exactly what everybody needs to do. Much more on teamwork, much more on supporting normative commitment to innovation, to process innovation. And still relatively very constrained. It is the automobile industry. We're not talking about high-tech industries. But there you have a very different orientation in terms of setting up the motivation and relationships among workers, between workers and management. You move from having 70 process engineers on the floor telling each employee exactly what to do, to having none. And having the teams have a lot of autonomy on how they do things. That started a movement, again, in organizational sociology and management science, of people starting to say, wait, maybe we shouldn't be thinking purely in terms of whether workers shirk or not, and how the firm exactly monitors against shirking and how it employs rewards and how it employs monitoring up and down the line, because we assume that everyone, from the top management down to the last employee, is going to be try to shirk and d therefore we need to set up the incentives just right. In all of these disciplines, the last 20 years and particularly the' 90s onward, have seen emerging studies, some models, some experiments, some observational field studies, that are showing, A) that people systematically do not behave according to the traditions of selfish rationality under controlled conditions; B) that when you set up systems with different assumptions, you get different behavior, and you get actually better results. There is a beautiful study, for example, from two or three years ago about knowledge workers. Knowledge work is one of the hard things to get precise in contracts. How do you tell somebody, "How creative have you been at 11:00 in the morning?" And so that's a classic place where having precise contracts to precisely monitor what you do and what you don't do becomes very difficult. They did observational studies, and they built a model and they built observational studies. What happens to knowledge-sharing within teams if on the one hand, you create explicit incentives, monitor the incentives, you share more, you get more; on the other hand, you build much more team spirit and you make it the thing that's the right thing to do as a member of this team and create much more social relations within the team. What they found was ... setting up a social dynamic that's a team dynamic, and what's understood to be the right thing to do achieves much greater internal knowledge flows than setting up an effort to create incentives. So you have very real implications. As we're sitting here talking, and GM is teetering on the edge, one of the ways that's interesting to think about it is to see that GM in many of its structural components is the quintessential output of models based on selfish rationality. If we look both at the shop floor structure, at the supply chain structure and at the executive compensation structure, along all three of those dimensions, it's implementing theories of organization that assume shirking unless you get the material incentives just right. At the shop floor level, a lot of process engineering, a lot of monitoring, very precise specification of actions. You basically have to specify the actions, you have to monitor, you have to compensate for successful action and punish for not, and you have to then have the managers have more managers on top of them, until you go all the way up. That's one level in terms of the internal. It's a very monitoring and controlling hierarchy system. Then starting in the late '80s but really reaching a peak in 1990, we have this invention by Jensen and Murphy of agency theory. The theory there was, everybody's trying to shirk. And the way you solve is somebody above the monitors. Well, who monitors the monitors? Somebody above them. When you get to the very top executives, what do you have to do? You can't monitor them. It straddles all the way down up to a point. The answer is, what you have to do is you have to align the incentives of the person at the top with the company. That way they don't want to shirk, because for every dollar that the company is making, they are making ten cents or however much they're making. The result? Executive compensation packages that emerged in the 1990s. If you look at the U.S. around 1980, its executives are making roughly the same multiple of what an aligned employee is making as European counterparts. Japanese counterparts making somewhat less. This is on the order of 30 to 50 times as much. Fifteen years later, you see multiples of 200 and 500. Across the board. You get to a point where you look in the mid-2000s, and the CEO of GM is making more than the top 21 executives at Honda put together. But it's theory-driven. You need to align the incentives just right, because otherwise, the person at the top will shirk. Well, the fact of the matter is we didn't get this alignment. In the last five or six years, even Jensen and Murphy themselves in later studies became very cautious about the degree to which they thought that it worked. You had more fraud. The percentage of companies that had questionable tax filings, for example, was correlated to the degree of executive compensation, because you're looking for quick fixes. You are drawing people who are particularly motivated by these high returns, and you're compensating them in ways that allow them to pull out returns very quickly. Essentially you actually didn't get even what you wanted there. You got a mis-alignment of incentives. And the third is with supplier relations. Again, over the course of the last 20 years there's been a bit of a convergence between the Japanese company's relationship with suppliers and the American company's relationship with suppliers. The Japanese company is becoming a little less tightly bound than they were in keiretsus, and the American firm is becoming more connected with long-term contracts. But again, if you look at the studies of this industry, what you see is that the big three continued to in various ways defect. They would get to a certain point in negotiations, then suddenly they'd demand a five percent reduction. Or suddenly they would take plans for an innovation and give it to a competitor to set up competitive bidding. You had a breakdown of trust. Japanese companies didn't. The same exact U.S. suppliers working with firms manufacturing in the U.S. produced different levels of technology and different levels of efficiency because of who they were dealing with. At all of these layers you see a company, and in many senses this is true of Detroit more generally, but in GM this is a specific case. There is a theory-driven set of practices that are about monitoring people below, incentivizing people above, and always trying to make sure that you set up the relationships so that you extract everything. Not a big success. I have been looking at the social implications of the Internet and network societies since the early 90s. Before that, I was looking at questions of property and 19th century land reform in the U.S. in the Homestead Act, and it struck me as identical. Because it was about how we structure the basic rules of control over the core productive resources of our economy, as a way of structuring both economy and society. I stumbled across, by mistake, the beginnings of questions of law with regard to the Net and suddenly understood that I was looking at a major decision point 150 years ago, but in fact we're at a major decision point now. These are the core resources that will decide who has economic power, who has social power, who has political power, what are the modalities of organization. The decision point is whether we will have a much more radically distributed capacity to create knowledge, information and culture, and participate in the creation of knowledge, information and culture, or whether we will have a replicated and only slightly different industrial structure to information and knowledge production. So that late 19th and throughout the 20th century model, we very much follow an industrial model, relatively highly capitalized in contractual and hierarchical relationships within firms, be it the big five accounting firms, be it the old IBM, be it AT&T, be it the Hollywood movie studios, based very much on the sale of information and culture as goods, with a relatively concentrated industry and a small number of players controlling a relatively limited set of creators. A very stark separation between producers and consumers, with consumers conceived as relatively passive and watching culture. Where we are now, and we already know that we are there, is in a much more permeable and fluid society and a much more permeable cultural environment where the difference between producers and consumers is much more blurred. Where this category of users has become absolutely central to everything we do. So when we talk about newspapers, we have to think about the users who communicate with a commercial organization like TPM, the users who basically get together and make their own new party presses, like DailyKos or Townhall, like the users who make up YouTube, like the users who make up Wikipedia. Suddenly you have radically decentralized practical capacity to act. And what do people do? They act. They use chunks of time, particularly chunks of time that they used to spend watching passively finished goods as entertainment, in an activity that's a social activity and a creative activity and an expressive activity on a very large scale. This is tilting all of our information, knowledge and cultural industries something between a quarter and two-thirds of the way around. Because in addition, government will continue to fund some science, some arts, et cetera. Commercial organizations will continue to do the same thing. Individual selling in markets will, but also social production now comes in as a major force. And that re-aligns in different industries more, in different industries less. In music today, for example, we're seeing the recording industry fighting an ongoing battle, but we're beginning to see artists really coming out and having a much more direct relationship with their fans. In film, we're seeing a much more widely dispersed set of preferences and tastes that are able to be addressed, some of them simply because of the Netflix/Amazon phenomenon of long tale. All sorts of niche documentary movies that could only exist from government funding or philanthropy now have an occasional small market as well, through Netflix or through Amazon. But much of it also through the fact that people with very simple and relatively inexpensive means can create interesting little snippets. In response, we're changing our preference, and it's more interesting to look at ten different really quirky interesting insights into life, than it is to watch another failed TV series. But the decision point is essentially which of these worlds we go. And it's a decision point we're making through law. The copyright wars are a classic instance of trying to set up the technology and the legal environment in such a way that you can keep the horse in the barn, and rent it out for rides, as opposed to having all the horses out. Situations where you get digital rights management and criminalization of breaking or distributing things that overcome digital rights management. That's a place where you see law playing catch-up against the technology that doesn't want to be there, or that isn't going there in any particular way. Interesting what'll happen with Kindle, right? Once you can actually load whatever you're downloading into something that's the only thing you're going to use, that gets more ambiguous. I think it's very hard to bring yourself to read in poor formats. I saw that the Kindle is now on the iPhone. I haven't actually seen how good the quality is in terms of whether it could actually replace the book. The book's a really good technology. It's really very good. I mean, there's a reason it's been around for so long. It's not that easy to overcome. Joi Ito's new book is a very interesting project. It's basically amateur photographer turned maybe publisher of his own book with a combination of saying so what will be scarce in this digital environment? One thing that will be scarce will be authenticity. Authentic connection with a thing that has a unique artifact value. A physical thing. Some of the books that have very high production value, that are signed by him, et cetera, go for a very high price. I don't know how much he's selling them for, but on the order or three or low four figures per unit. Some are limited edition-like prints. Somewhat lower. But free, the photos are free. Trying to actually create this kind of a situation where you try to see what is it that is non-fungible when the material is fungible. And the non-fungible is the human relationships. That's where the talks come from, that's where the services and teaching come from, that's where the live performance for the musician comes from. In some cases the spectacle is really the equivalent of the rock star live performance. It's not at all about the human relation, it's about the unique experience. Which in some sense is somewhere between the human connection and the artifact. I’m a Professor at Harvard Law School, and I’m Co-Director of the Berkman Center for Internet & Society. The Berkmen Center's origin was in the law school; now it's a university center. We have now and increasingly have more people from every single discipline. I'm trying to think of some of my own collaborations. One is with students in Martin Nowak's program on evolutionary dynamics, some of the work is with people in political science doing text analysis, and a couple of different groups at the computer science department doing different kinds of modeling and online experimentation. And some sociologists and some psychology students. These are all different collaborative projects that are part of this effort to try to understand cooperation and human cooperation. The Berkman Center is now quickly becoming very interdisciplinary, and part of what we are doing is to build open research platforms that will allow any social scientist to use web-based tools to conduct both controlled experiments and large-scale, computationally-supported observational studies. Another aspect of the Berkman Center that is very interesting is it's place at the intersection of academia and activism. There are quite a few people among the fellows who are social activists or social practitioners, bloggers, people who organized all sorts of online groups and activities. It's a very interesting conversation between people who come from academia and from science.